Frank Wallace is best known as the man behind the futuristic look of the Oral Roberts University campus. On October 14, 2010 his unique home overlooking ORU will be sold in a public auction conducted by Mister Ed's Auctions. Jackie and I recently had a chance to visit with Mr. Wallace and learn more about the house, his career and his thoughts on architecture. When we visited we expected to snap a few photos of an empty house and speak with a rep- resentative from the auction company. To our surprise the door opened and we were greeted by Mr. Wallace himself. After assuring him we were not architects, he let us look around. Unfortunately we were not prepared to interview the man whose buildings incite such extremely diverse reactions- but that didn't stop me from asking him several questions anyway. 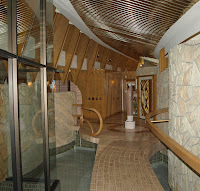 The home, completed in 1980, was designed and built by Wallace who is now 87. The expansive home is so large that Wallace spends most of his time in a room that was his late wife's studio. At more than 5,000 square feet (over 6,000 if you count the indoor pool) the house isn't enormous compared to nearby McMansions, but still mighty large for one person. Out front you're greeted by immense metal gates that were built locally by Ernest Wiemman Metalcraft, a firm better known for more traditional iron work.When Wallace initially approached the firm about fabricating the two gates Wiemann wasn't interested. It took persuasion from the workers who thought the job looked more fun than their usual fare. 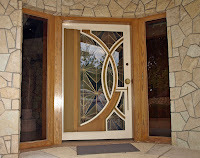 The front door is also an extravagant unit that was built on-site, and Wallace claims "cost more than either of my first two houses." It's heft is obvious as you open it, yet it moves freely on the massive hinges that support it. Even the knob is huge! 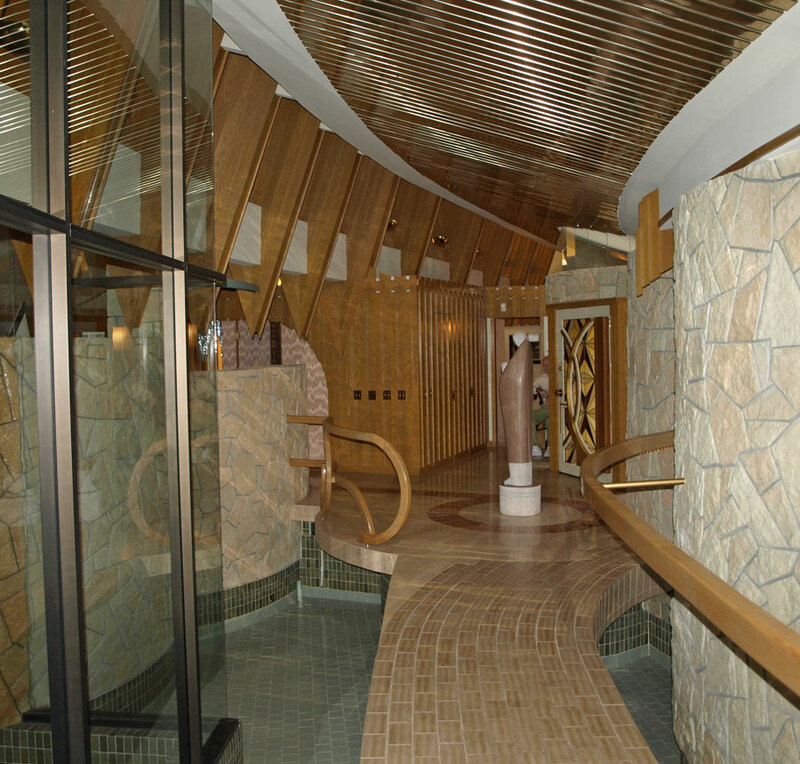 Once inside, the entryway curves off to your left past the indoor pool. There's a den to your right, and steps lead down to the main living area. 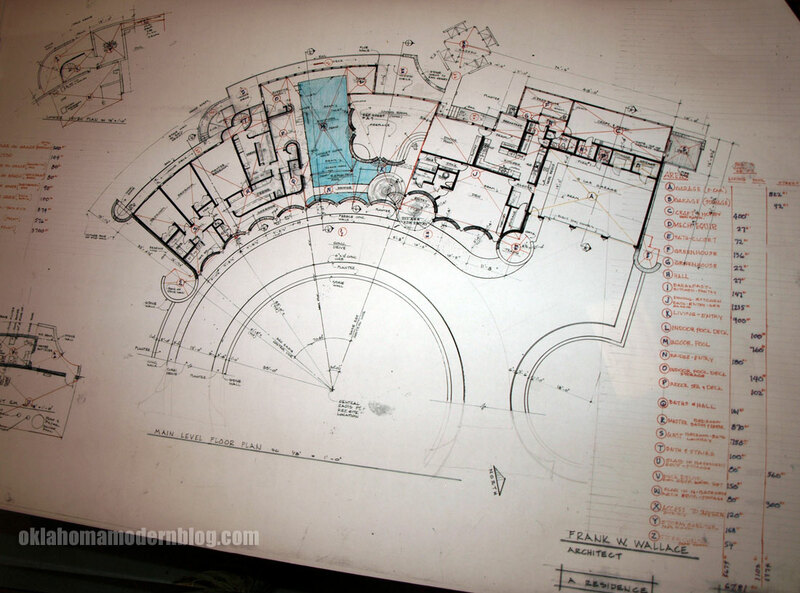 The entire floor plan is a semi-circle, and the round theme is carried throughout the house. I found one of the showers especially interesting because it used this theme to maximum effect- by curling the wall around like a conch shell, it negates the need for a shower door. Dominating the center of the house is the swimming pool. Wallace was an avid swimmer, and used the pool every day for over a year. Another notable feature is the masonry. All of the rock work is geometric cut stone. This gives the house an interesting aesthetic- sculpted yet organic. Natural light pours in all around us through windows and skylights, even on this overcast afternoon. Outside, the house still has a few surprises to offer. A deck extends across the rear of the house. In addition to the breathtaking view, a walkway connects to a unique gazebo. The angular shape suggests a pine cone floating high above the hill below. Back inside the house I couldn't help but notice design cues reminiscent of other architects. The organic lines and asymmetric shapes certainly suggest Bruce Goff. 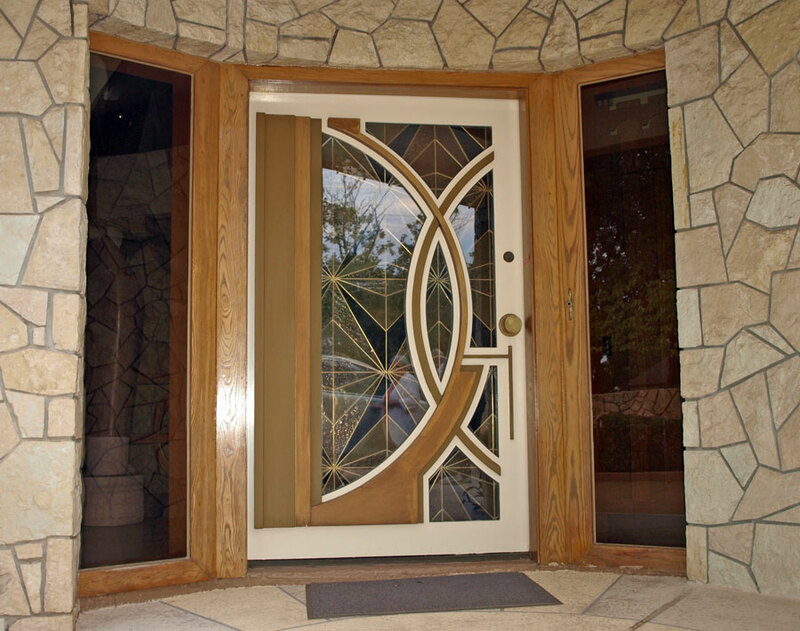 The use of structural glass and built-in features might suggest Frank Lloyd Wright. Yet the functionality and structural integrity trump either in my opinion. Despite the unconventional design, no sign of a roof leak or masonry crack were visible anywhere. Despite its location on the side of a hill, and Tulsa's notorious clay soil, the structure appeared as sound as the day it was built. 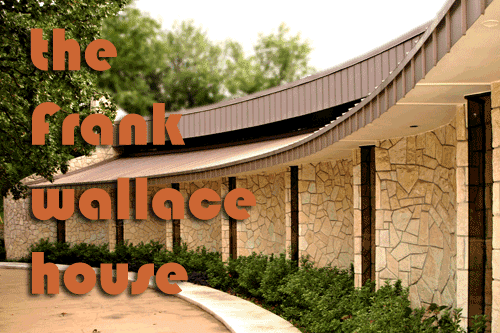 But ask Wallace about his architectural influences and you'll get a surprising answer. He doesn't see himself as a modernist architect. In fact, he seems to eschew the entire title of architect and likens himself more to a sculptor. His whole career in architecture came in quite a roundabout fashion. Wallace is from Afton, Oklahoma and, despite never graduating from high school, received his architectural degree from the University of Arkansas in 1952. After serving in the Infantry during World War II, he returned home and took advantage of the G.I. Bill to attend college. His good friend was confined to a wheelchair and was headed to Fayetteville. Since the friend needed someone to help him get around campus, Wallace decided to come along. Then it came time to pick a major. Someone had told him about a man they knew who was an architect and "made lots of money." Wallace wasn't even sure what an architect was. When he asked someone they told him architects drew plans for buildings. That sounded like art, and he had always enjoyed drawing, so architecture is what he studied. For much of his life Wallace enjoyed wood carving, or whittling as he called it. This "whittling" was far from folksy craft, based on the one example we saw in his living room. 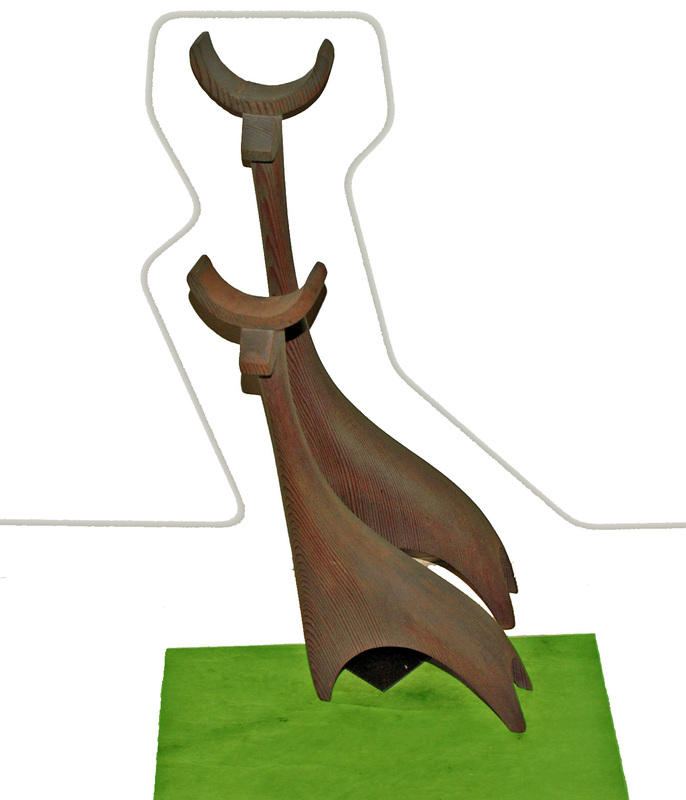 It was a pair of figures reminiscent of the finest in Danish design. I thought they looked like giraffes, Jackie thought they were reindeer. The cool thing was the shape of these small wooden figures echoed the sculptural lines of the curvy room we were standing in. For me it was sufficient evidence to substantiate his claim as a sculptor. The futuristic and angular buildings of ORU are what Frank Wallace will be remembered for, and eventually appreciated for. But the fluid lines of a couple of wooden giraffes are forever etched in my memory. The high bid was $620,000. Can anyone tell me what the high bid was and if it was accepted by Mr. Wallace. Thank you. Word we got was a local buyer bid $620k and it was accepted. I can't help but think a more competent auction company could have gotten so much more. Does anyone know the original cost of the house, and what has happened to Mr. Wallace since the sale of the house? I have also heard of a smaller, similar residence owned by the brother of Oral R.
This house is incredulously awesome. The architectural design is perfect and neat. The concrete materials used in this house are definitely excellent quality materials. The metal gates are great to make the entire house a more fabulous looking one. What an icredible talent who never got his due, in my opinion. I think he should have gotten The Pritzker. ORU should have an architecture school named after him and a building built in his honor by one of the great present-day architects. Jahn? Herzog de Mureon (sp? ), Richard Meier? He is very reclusive and doesn't seem to understand the admiration so many people have for his work. We had a really hard time getting him to speak with us at all- and even then only because the house was going on to the market. I think that Frank's work would have been more appreciated if his primary client hadn't been such a lightening rod of controversy. In Tulsa, during the fifties thru the seventies, Oral Roberts was either revered or despised by the locals. As a result, those who were tied to the ministry, in any form, were often treated in a similar manner. Had Mr. Wallace's clients been Phillips Petroleum, Unit Rig, or the Warren Foundation, it is likely that his legacy would be much different.